Each article of clothing is exclusively made by hand to meet your specific wishes and preferences; in strict accordance with traditional principles of tailoring. The soft, hand-sewn lining guarantees that the garment is more comfortable to wear than any other. 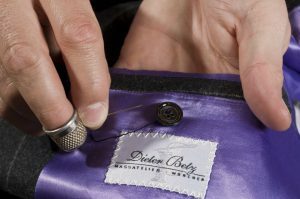 All the details of craftsmanship such as the buttonholes, the edges of the lapels and pockets, the lining seams, the armholes, the upper collar, the shoulder seam and even the darts and main seams are all done exclusively by hand. As a rule, a hand-made item of clothing requires three fitting sessions. Two weeks after the pattern design, there is the so-called “first fitting” session, in which you are able to get an initial feeling of your new article of clothing and we are able to carry out slight adjustments to the pattern. Completion of the article takes about six weeks in total. You receive a perfectly fitting article of clothing which combines the highest possible standards of luxury, individuality and quality tailoring. 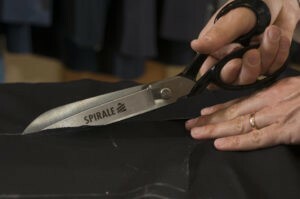 Processing details such as buttonholes, edges on lapel and pockets, the lining seams, the sleeve insert, the upper collar, the shoulders and even the darts and main seams are sewn exclusively by hand. Three dressings are usually provided for your handmade garment. Already two weeks after cutting a first, so-called “raw sample” is carried out, in which you get a first feeling for your new garment and we can still make cut corrections. The total production time is approx. 6 weeks. You get a perfect fitting piece of clothing that combines the highest level of luxury, individuality and tailoring. Suit hand-sewn € 2.835, – plus fabric.